Play opens Nov. 29, with a Charles Dickens' classic to get viewers in the holiday spirit. 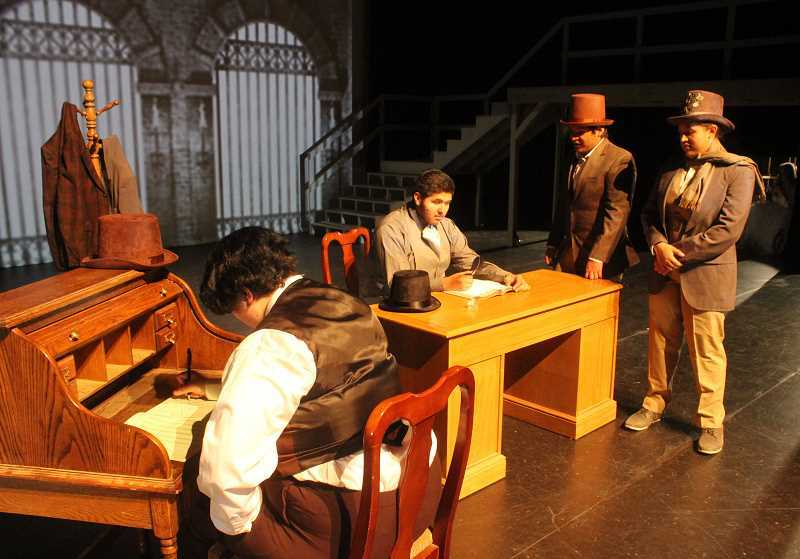 The play "A Christmas Carol," by Charles Dickens, will be presented by Madras High School Drama at the Madras Performing Arts Center, at 7 p.m., Thursday, Friday and Saturday, Nov. 29, 30, and Dec. 1 (after the Christmas parade). Tickets will be available at the door and are $7 for adults, $5 for students and seniors, and children 5 and under are free. One of Charles Dickens' most popular works, "A Christmas Carol," was first published in 1843. The book tells the story of Ebenezer Scrooge, an elderly miser who is visited by the spirits of Christmas past, present and future. After seeing the possible consequences of his selfish actions, Scrooge is transformed into a kinder, gentler man. With striking stage sets and period costumes, the play will be a fun way for those in the audience to get in the holiday spirit. Carolers: Aurora Strode, Crystal Correa Gonzalez, Aiden Moschetti, Mashauni Smith, Pricilla Villagomez and Heather Horn. Ebeneezer Scrooge, Miguel Santellano; Bob Cratchit, Julia Horn; Spirit of Christmas Past, Madison McCool; Spirit of Christmas Present, Nacho Ruiz; Spirit of Christmas Yet to Come, Iysha Torres; Ebeneezer's nephew Fred Hollowell, Allison Turek; Janet Hollowell, Fred's new wife, Vincent Boice. Mrs. Cratchit, Aileen Herbert; Belinda Cratchit, Vanessa Young; Martha Cratchit, Olivia Johnson; Peter Cratchit, Delilah Shepard; Tiny Tim, Baltasar Estrada; Mr. Jeeves (a charity solicitor), Aileen Herbert; Mr. Howell (charity solicitor), Jasper Smith; Jacob Marley (Ebeneezer's dead partner) Victoria Pla. School-age Ebeneezer, Manny Ruiz; young adult Ebeneezer, Aiden Abshere; Ebeneezer's little sister, Gillian Ahern; Mr. Fezziwig (Ebeneezer's jovial employer), Julia Horn; Mrs. Fezziwig , April Cunningham; Belle (Ebeneezer's young romance) Hope Magare-Strawn. Gentlemen, Iysha Torres and Fawntana Arthur; Old Joe the junk dealer, April Cunningham; Mrs. Oliver the charwoman, Victoria Pla; Mrs. Dilber the laundress, Allison Turek; Mr. Tackleton the undertaker, Jasper Smith; Poulterer, Kainan Samuels; and Caroline, Alyssa Collver.